Rice has been a staple in the USA since its introduction in the late 1600’s. However, rice production methods have dramatically changed over time with technology playing an increasingly important role and becoming the key to sustainability and maintaining profitability. According to U.S.A. Rice, American rice farmers have been able to reduce water use by 53%, reduce energy use by 38%, and reduce land use by 35% over the past 20 years while still yielding the same food standard (or better) and quantity, while being GMO-free. These significant gains would not be possible without technology. In recent decades, labor costs and availability of farm labor across the US has become more expensive and hard to find. Add to that farmers need to juggle natural variables - weather, pests, disease, soil, moisture, sunlight, etc. - while still producing high yield crops, improving sustainability, and maintaining profit margins. Farmers have needed to be innovative, while technology and automation have had to find ways to support them. Shifting from traditional rice farming techniques that involved constant flooding of the fields - which is also extremely labor intensive - most farmers now utilize intermittent irrigation. With computers monitoring soil moisture levels, water can be added or removed from the fields automatically, improving yields and production capabilities. Laser guides are now used by many farmers to level soil and monitor water levels. This allows for more controlled farming techniques and ultimately more consistency for the grain throughout growing seasons. Utilizing drones for agriculture has become a common practice. With better and frequent aerial images, water levels in the area have become easier to monitor and regulate. Drones have proven to save farmers significant amounts of time on a day-to-day basis. Because of technology, irrigation systems drain water easily from the fields. Sophisticated equipment has been able to automate the previously labor-intensive practice of harvesting the plant and separating the grain from the stalk, preparing the rice for milling. Consumer demands have dramatically increased with regards to food quality over the recent decade. Farmers have had to find ways to meet these demands, while maintaining profitability, meet regulations, and improve their sustainability - technology and automation have allowed the industry to succeed and thrive, providing America with 85% of the rice they eat. When rice reaches the mill, technology is everywhere. Utilizing heavy machinery for the milling process and lasers and computers for quality control and sorting. 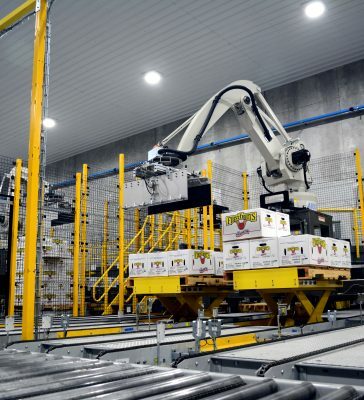 Automation in bagging and robotic palletizing has reduced labor time, revolutionizing this end stage of production that is often costly. Columbia/Okura and Statec Binder recently partnered to create an integrated bagging solution – perfect for rice production and many other industries.